Marketing Information: The wireless all-in-one printer for pro-quality photos up to 11" x 17". The Expression Photo XP-960 wireless, wide-format Small-in-One printer puts professional-quality photo printing at your fingertips. 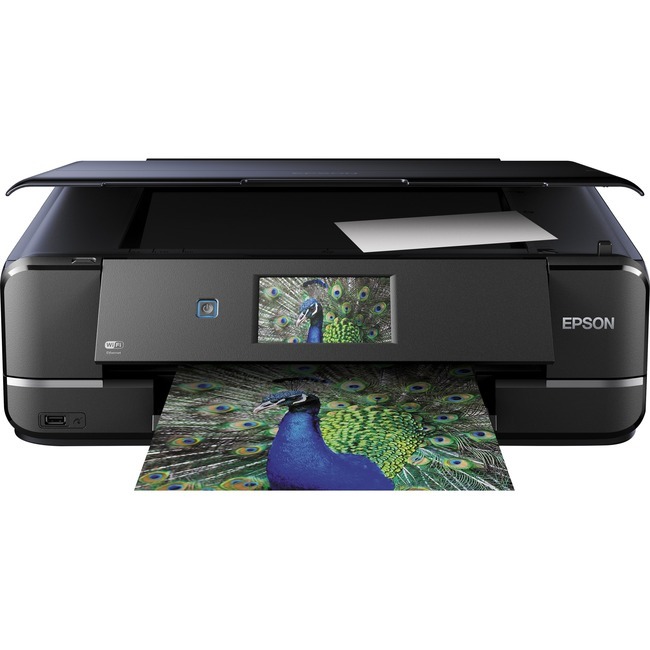 Featuring six-color ultra HD inks, this compact all-in-one is also powerful, printing 4" x 6" photos in as fast as 11 seconds. Easily print from your iPad®, iPhone®, tablet or smartphone - with or without a router - at home or on the go. Quickly produce stunning borderless photos up to 11" x 17" - or print on specialty paper and DVDs. The innovative, fold-over scan lid holds originals in place. An intuitive 4.3" touchscreen makes tasks easy. Plus, you can easily print Facebook® photos and more with Epson's Creative Print App. Media Size: DL Envelope - 4.50" x 6.37"
Media Size: C6 Envelope - 8.50" x 11"
Media Size: B5 - 6.92" x 9.84"